Infant Car Seat, G3 Stroller and G3 Stroller Seat thanks to Orbit Baby. Now that spring is officially here and the weather has started warming up, we’ve been getting out of the house much more often and we like to take walks with our Dasher boy to the park and play around. 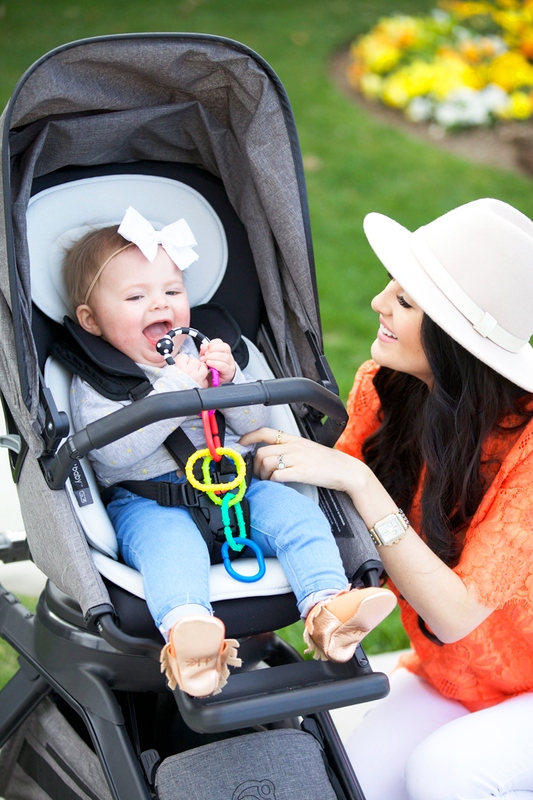 Little miss Isla is getting so aware of everything around her, she loves going on rides in her stroller! She points to everything she sees and says “Ada.” It’s the cutest thing ever!! We had to get a new carseat for Isla a few weeks ago (thanks to the fur brother who likes to chew anything plastic, he got creative on that one). I wanted to have a stroller that I can click my carseat into, so we got the stroller that matches the car seat too! I’m kind of obsessed with the grey color that’s apart of Orbit Baby’s Porter Collection. The reason I ended up choosing to get the Orbit Carseat is because it rotates 360 degrees!!!!!! If you have a baby you seriously HAVE to get this carseat… it sooooo much easier to get Isla in and out of the car because I can rotate it towards me. No more awkwardly climbing in the car and hunching over to buckle and unbuckle her (all you mamas out there know exactly what I’m talking about!!). I wish we would’ve discovered it sooner because it seriously makes such a difference! Also I love how compact Orbit Baby’s stroller folds, it makes everyday travel so simple and easy. Have you guys tried Orbit Baby? What do you think of it?! Isla is so adorable! 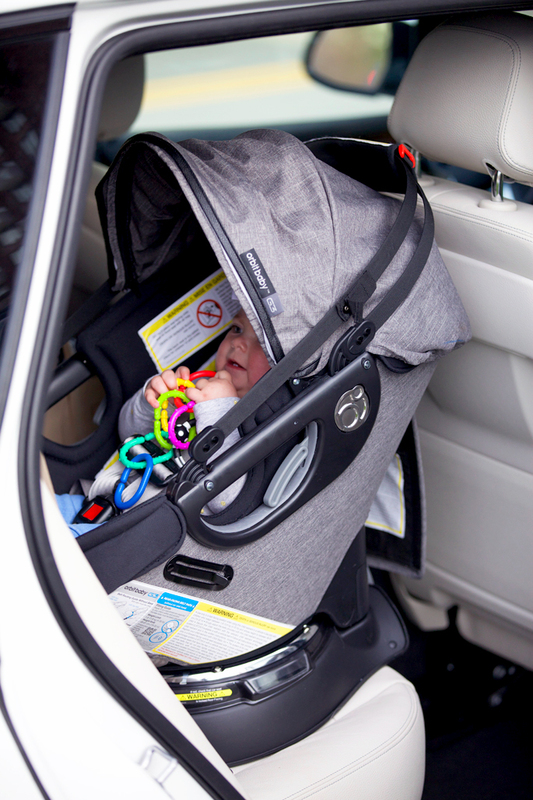 The Orbit carseat looks so convenient – especially when getting her in and out of the car. I can imagine it’s a struggle otherwise. Also loving your top here – so pretty! That stroller and car seat looks awesome! Love your top, the bright orange is such a great color! Your outfit is so cute, I’ve been eyeing a hat like that. Great for bad hair days and it looks so chic. Isla is so cute! I can totally see how the rotation would be so helpful! Love your top and hat! That car seat and stroller sounds great! And Isla is adorable! I love that top! Its so gorgeous! You and Isla are so precious!! Oh my goodness! Silly pup!! That is so cool!!! There is nothing harder than trying to get a little, squirming little one out of a car seat that is turned sideways. Love this concept. You look adorable in that hat and orange. Isla is so cute, I love her little bows! Also, I love your outfit, perfect for spring/summer time! This is SO great! Love that it rotates! I’ve got a baby coming in September, so I’m going to have to add Orbit to the list! So exciting!!! Boy or girl? We really love Orbit! Looks super convenient and easy to bring around! Love your outfit and little Isla’s too! My husband and I are looking for a good SUV for our expanding family, and I was curious what kind of car you drive? Ps- you are my absolute favorite fashion blogger!! I’m such a huge fan!! And your family is beautiful. Love your hat! Isla is getting so cute!!! Such a pretty top – love the bright color!! Love the photos! You look so pretty in your outfit! I am having my second baby in May and I so wish I had seen this carseat! I already bought mine but man would it be awesome to have one that rotated liked that. Such an awesome idea!!! I love your outfit!! Isla is seriously so adorable too! We came close to getting the orbit, because of the 360 feature, but I didn’t love the way it looked as much as the bugaboo (eye roll). Now that swivel feature is looking better and better! Where do you store your strollers? I like having different options, but I’m starting to feel like they need their own garage, ha! And Isla’s zara outfits are killing me- what a sweetheart! We have a four month old daughter and we adore our Orbit! I knew I wanted it before we even got pregnant and I’m glad I waited until the Porter edition came out to purchase the system. We ordered it the day it released and couldn’t be happier with the whole system. In fact, we just ordered the O2 jogging base for walks and jogs in our neighborhood. I love the rotation and that the fabrics are non-toxic and washable. We also used the bassinet until about a month ago when she outgrew it. The bassinet was great on the stroller when she was an infant and on the bassinet base in our house for a downstairs napping location. We also used the bassinet as her bed (on the stroller base with it locked) when we traveled with her. I recommend the Orbit system to every new mom I meet! Love your style girl! So inspirational! I got the first generation Orbit in 2008-a long time ago! I’m sure it has changed a lot since then. I used mine for three kids. The infant seat is still going strong, but I think I needed three bases. They were not as durable as I expected. I liked the infant seat much more than the first generation toddler car seat. It was very heavy and not practical to use in the stroller system. This review might be obsolete with new models out though. *bases meaning stroller bases not car seat bases. The car seat base held up fine. This stroller system looks amazing. I wish I had it when my son was little. Such convenience. That car seat is amazing! Spinning- what will they invent next. My baby is a few months older than Isla and we are just about ready to move him into the big kid seat. 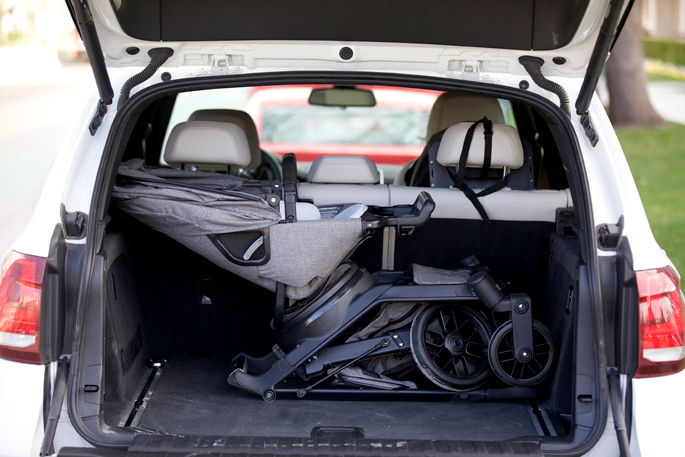 We love the Diono Radian – it has a slim design so you can fit multiple car seats across the row. Love all your recommendations, wish this one was a year earlier for me! Such beautiful photos of you and Ilsa. You make me excited to start a family! :) And I *love* your shoes. I wish this stroller was around when I had my baby, would definitely buy this. The 360 feature minimizes a lot of pain with conventional car seats. Looks like the orbit is so functional!